White wine coq au vin, from Sunset's Test Kitchen. Photograph by Peden + Munk. White wine coq au vin, from Sunset’s Test Kitchen. Photograph by Peden + Munk. Your great-grandma probably lived on a budget, between wars. She didn’t throw anything away if she could help it; she found clever (and I hope for your family’s sake, delicious), ways of using scraps and trimmings. She probably assessed her fridge and pantry on a daily basis and worked whatever she found into a series of nourishing dinners. In short, she learned how to use her leftovers. As it turns out, throwing away leftovers is not only a waste of money, but also a mean thing to do to the planet: rotting leftovers release methane, a gas that the EPA says is 20 times more damaging to the environment than carbon dioxide. Not good. Great-grandma probably made a lot of soup. 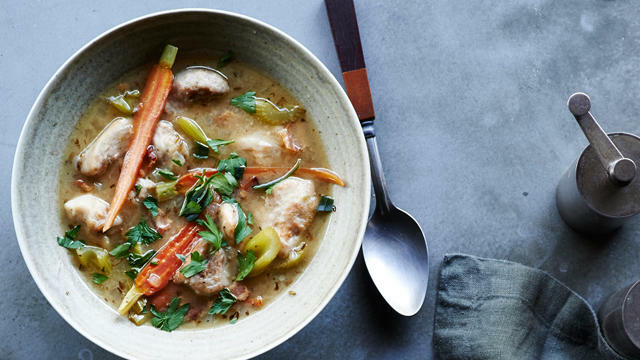 Soup is the miracle way to use up leftovers. Cooked meat, rice, pasta, vegetables—just about anything can go into soup. In honor of Earth Day and inspired by my great-grandma, my grandma, and especially my mother, who makes soup at least twice a week, I’m going to make soup tonight. Chicken broth that I made and froze a couple of months ago, as a gift to my future self. Thank you, self! A tiny bit of white wine. Not as much as the recipe calls for, but the soup will taste good anyway. Carrots, onions, potatoes, and half a fresh fennel bulb. A couple of dried red chiles. The hard, impossible-to-grate heel of a chunk of Parmesan cheese that has been in my fridge for approximately a month. At the very end, tons of fresh herbs—some of them from the pots on my patio: Parsley, cilantro, a little mint, even. This will all take about half an hour. Then my significant other, Peter, and I will sit down to huge bowls of this bright, fragrant soup, with crusty bread. We’ll have a glass of wine and drizzle some olive oil into our bowls, and we’ll be happy.